This classic watch by German fashion house Hugo Boss, is the sophisticated timepiece you need on your wrist. The encased stainless steel is complemented by the silver dial adding to the opulence of the design. The watch is beautifully finished with Roman numerals markings around the perimeter of the dial. 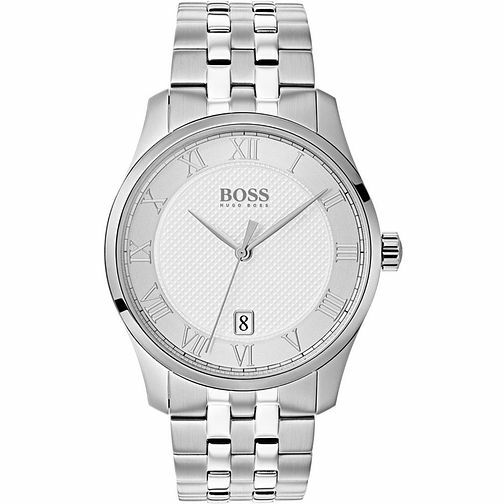 Hugo Boss Stainless Steel Silver Bracelet Watch is rated 5.0 out of 5 by 1. Rated 5 out of 5 by Anonymous from Perfect present for my boyfriends 30th birthday Arrived quickly with a nice presentation box. Very clean looking dress watch. My boyfriend was very pleased with it.